While we were in New York City for our East Coast Easter trip, I walked to this statue of Chester Allan Arthur. I have wanted to visit this waymark ever since finishing his biography. This waymark is located in Madison Square Park, New York City, New York. The GPS coordinates for this location are 40° 44' 34.5" N 73° 59' 14.9" W.
The sculpture is bronze. It was cast in 1898. The sculptor was George Edwin Bissell [1839-1920]. The founder was Henry-Bonnard Bronze Company. The architect was James Brown Lord [1859-1902]. The base is polished Barre, Vermont granite set on concrete. The statue was dedicated June 13, 1899. Chester Arthur stands holding a book in his proper left hand. His proper right hand is bent at the elbow and rests at his waist. Behind him is an elaborate armchair which has the presidential seal on the back. An Oriental rug is draped over the seat of the chair. The inscriptions on the statue include: (Right side near base of sculpture:) GEO. E. BISSELL/SCULPTOR 1898 (Back side of sculpture:) THE HENRY-BONNARD BRONZE CO./FOUNDERS, NY (Front side of sculpture:) JAMES BROWN LORD/ARCHITECT (Front of pedestal:) CHESTER ALAN/ARTHUR/TWENTY-FIRST PRESIDENT/OF/THE UNITED STATES/OF AMERICA signed Founder's mark appears. 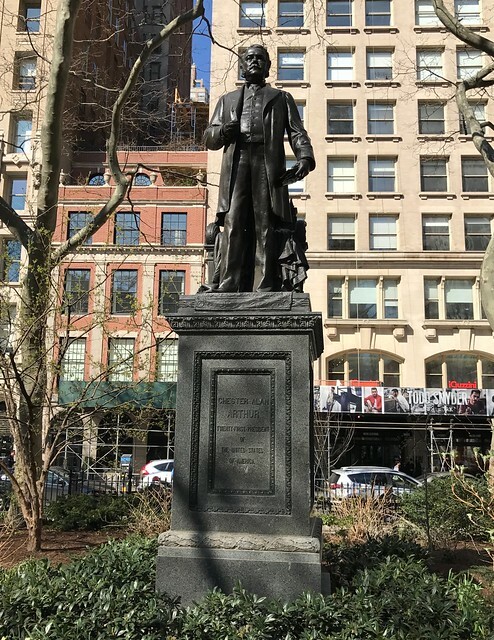 This sculpture was the last installation of a group of four political contemporaries--Roscoe Conkling, Admiral Farragut, and William Seward--were already installed around the corners of Madison Square.